Why has Kombian not been killed yet? 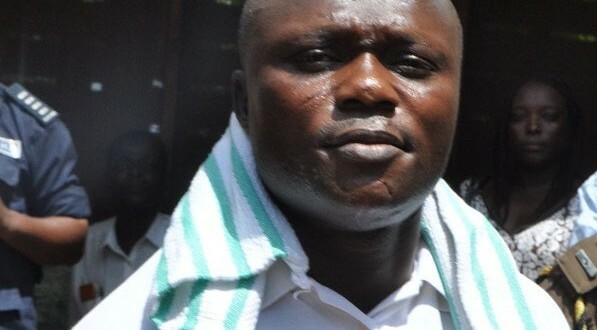 I have been reading in some news outlets that Johnson Kombian, the man who is on record to have broken jail in Tamale and escaped when he was serving a term there had attempted to escape from the Nsawam Medium Security Prison. The state is just keeping this Kombian guy at the risk of these prisons officers just to worry them for nothing in my opinion. Assuming this Kombian guy succeeded in breaking jail, that is when we would have seen a tall list of prison officers lined up and ready to be dismissed for not doing their work well when in actual fact, there is a court ruling that this man should be killed for “crimes against humanity”. Most of these officers who are probably in the junior ranks would have found themselves in serious trouble and committees and boards may have been set up to investigate how the Kombian guy might have managed to escaped. As these committees and boards may be sitting comfortably in some air conditioned rooms investigating how Kombian might have escaped, he might have already found himself on the streets causing havoc to unsuspecting and innocent Ghanaians. Which country koraaaa is this? Our laws are very clear on the fate of people like Kombian as far as criminal justice is concerned. To put it in a biblical way, our laws endorse “he who draws the sword, dies by the sword”. In Ghanaian law, section 46 of Act 29/60 categorically states that “whoever commits murder shall be liable to suffer death”. Initially we advocated against instant justice and mob attacks and told the people that the courts are the only mandated bodies to find people who are suspected to have committed crimes guilty or otherwise so that justice can prevail. The courts have succeeded in finding Kombian guilty after prosecution has proven beyond all reasonable doubts and here we are moving Kombian from one prison to the other wasting precious state resources on him. This is very funny in a country like Ghana with bad security arrangements. Kombian is a “dead goat” who doesn’t care whether he breaks jail or not. In fact if he succeeds in breaking the jail, it will add up to his criminal CV since he is on record to have broken jail in Tamale. People like Kombian who have been slapped with the death penalty and know that no amount of appeals will exonerate them will always take the risk to break jail anytime at the least opportunity. It is however to his advantage he should succeed in breaking jail. We are just keeping this guy for nothing at the risk of the prison officers and their families. The law says he should be killed and whoever that is responsible for ensuring Kombian is killed is just being irresponsible. It is very unfortunate we have organisations like Amnesty International and others going about advocating that the death penalty should be abolished from our law books without recourse to how structures in our prisons should be improved first to contain hardened criminals like Kombian. These organizations compare prisons in USA, Canada, Britain, Netherlands and other developed nations to our prisons here in Ghana which are very appalling. Here we are in Ghana granting bail to hardened criminals and making moves to abolish the death penalty because of international pressure on us as a country. For us in the police, the deaths of Constable Prince Agyare and Constable Owusu Frimpong who lost their lives as a result of attacks on them by this Kombian guy leave a big scar in our memories. In fact is still fresh in our minds how our colleagues were murdered in cold blood and we are still in fear of attacks especially when Kombian is making attempts to break jail. I remember how Corporal Owusu Frimpong recounted his pain and neglect whilst the state looked on. The corporal said openly to hearing of the whole world how he was supposed to have been flown abroad for further treatment and surgery but nothing was done about it. This year alone, a lot of police officers have gone down as a result of robbery attacks and fighting of other dangerous crimes and we cannot afford to have Kombian too on the streets again. I have been told it’s the president who signs the death warrant for people like Kombian to be executed. Ever since Kombian was found guilty by the court, I keep asking myself what prevents him from signing the warrants for people like Kombian who have committed heinous crimes against humanity be killed? My checks show that the last time somebody was executed was in 1993 and since then all those on death row are dumped in prison and allowed to rot away. Those who stay in prison for long periods are sometimes given amnesty after wasting other people’s lives freely. The behaviour of Kombian if not nipped in the bud will continue to be a threat to the prison officers since he is likely to recruit more people to buy into his “break jail ideology” in prison. With people like Kombian in our prisons, the prison officers themselves know the threat that it poses to them. He will continue to be a thorn in our fresh if he is allowed to be lingering in our prisons making attempts to break jail. If all the prisoners on death row cannot be excuted, Kombian alone should be killed to make our prisons safer for the inmates in general and our prison officers in particular.